Soft and elegant bath rug, feels great on your feet - non slip skid resistant backing so that you won&apos;t slip and fall after the shower on a wet surface. 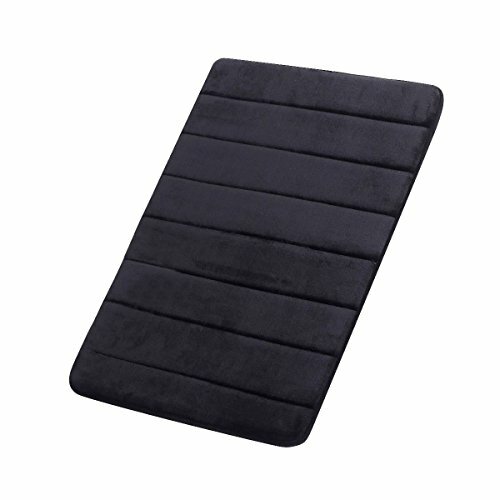 FindNew 16"*24" Microfiber Memory Foam Bath Mat Have you ever feel cool when you come out the bathtub or bathroom? Soft,comfortable,non-slip Flame bottom,easy to clean and market other bathroom mat products biggest difference is that FindNew bath mats unique design and gentle slow return bomb bath mats internal filling using memory foam that allows you to set foot more soft skin-friendly,FindNew mat is your best chose,let you feel the high quality of home life. Feature 1.Machine made memory foam bath rug 2.Non slip bathroom rug 3.Memory foam bathroom rugs have strong water absorbing capacity Cover:100% Polyester Filling:100% Memory Foam Backing:PVC Flame Bottom Size:16"*24"(error of - / + 0.5 inch) This memory foam filling has been tested to ensure it is matched resistant in compliance with the relevant ignitability test. - Backing is made of Anti-slip latex. Increased skid resistance by 30%.Helps reduce mat movement. non slip skid resistant backing can prevent you or your family from slipping and falling after the shower on a wet surface.